French restaurant Angelus was opened by founder Thierry Tomasin in 2007 on a site that was once a pub and a covert meeting place for political figures such as Winston Churchill. It’s an elegant restaurant, styled in the art-nouveau fashion with dark wood, leather seating and elaborate mirrors. There is also a gorgeous bar and lounge area at the back of the restaurant for some chilled-out aperitifs before your meal. Angelus has recently launched a savoury (starter) and sweet (dessert) pichounettes menu. Pichounettes is French for ‘small-bites’, and is served at the Angelus bar from 11.00 am – 11.00 pm, Monday to Sunday inclusive. I love this way of eating where you get to try a variety of different things. Each platter is priced at £13, or for an additional £10, the platter will come with a glass of Angelium, the house champagne recently launched by the restaurant. 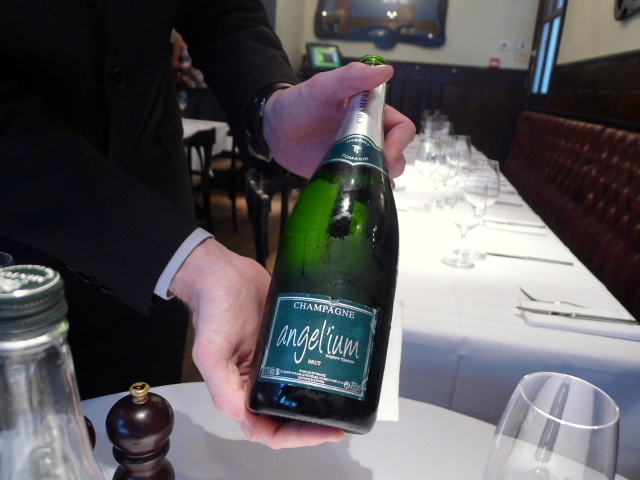 Seeing as Thierry Tomasin was previously a Head Sommerlier at Le Gavroche and has garnered accolades such as the Excellence Award MCA (Master of Culinary Art) from the Academy of Culinary Arts of Great Britain and a finalist placing at the 2005 Tatler Best Maitre D’ Awards, it is unsurprising that Angelus would develop its own house champagne. 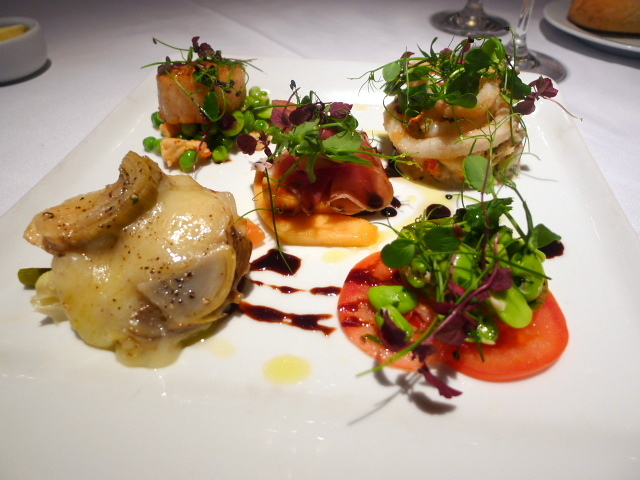 I was recently invited to sample the new pichounettes menu by the restaurant. Created by Head Chef Martin Nisbet who once trained with Anton Edelmann, the savoury pichounettes are designed to complement the champagne and are similar to the à la carte starter options. From the top left in a clockwise direction, a beautifully seared scallop gave way to a luscious opaque core. It was served on a bed of fresh summery peas and broad beans which had been dressed with a scrumptious lemongrass sauce. Next, deep-fried squid, coated with the lightest of breadcrumbs, was mounted on a bed of yummy crayfish cocktail. The squid was delightfully tender and a dream to eat. English heritage tomatoes on a layer of broad beans were finished with a light lemon and basil dressing. Also appetising was the artichoke and beaufort cheese terrine with mustard pickled vegetables. The acidity of the vegetables worked well to cut through the richness of the cheese. But the highlight of the pichounettes platter (centre of the picture) was the wonderful bayonne ham with charentais melon. The melon was wonderfully sweet and juicy, and worked a treat with the robust flavours of the ham. The addition of aromatic basil and balsamic vinegar completed this lovely flavour combination. 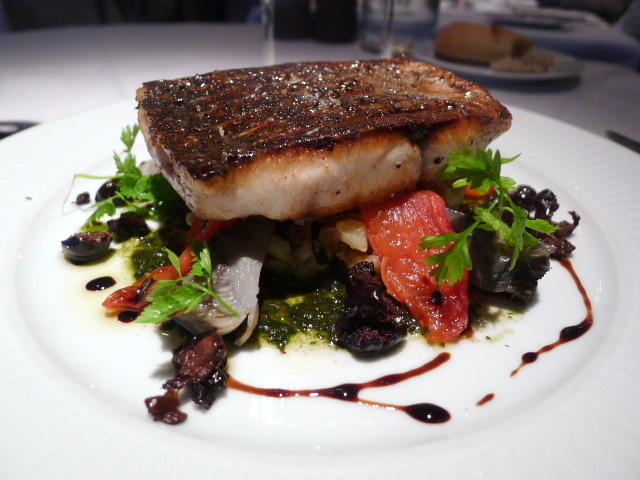 To the mains and a pan-fried stone bass (£26) was cooked to a crispy perfection. It came with a lovely, fresh combination of crushed potatoes, basil, artichokes, olives and tomatoes. 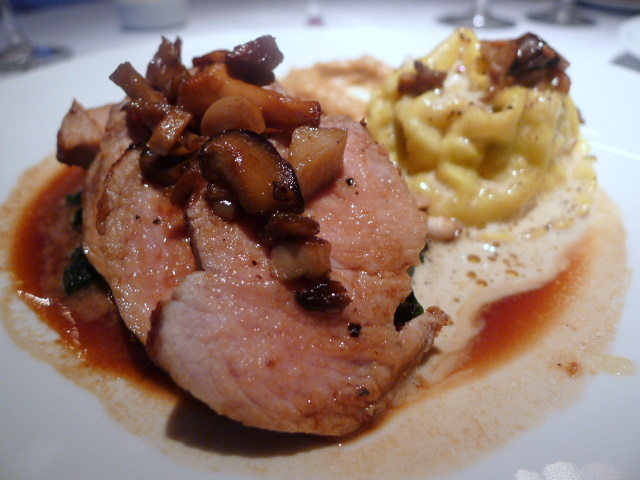 Loin of veal with wild mushrooms (£32) was accompanied by a braised shin raviolo and a caramelised onion purée. The loin was nicely cooked and tender and finished with a wonderful red wine jus. The purée was also lovely with its sweet hearty flavour. But the raviolo pasta was overcooked, and the braised shin a little bland. The mushrooms were also a touch over seasoned. To the dessert pichounettes platter (from the top left in a clockwise direction) we started with a millefeuille of vanilla poached peach which was delightful. The light and flaky puff pastry was excellent, and the peach tender and vanilla-y. Also excellent was the English ‘Mara des Bois’ strawberries with yoghurt mousse, elderflower jelly and a zingy refreshing strawberry sorbet. Ginger crème brûlée gave way to a creamy texture, and a dark chocolate and cherry tart with cherry sorbet was intoxicatingly rich. On the whole, the food was excellent, especially the starter pichounettes. Furthermore, I was completely wowed by the fact that such quality platters of food, containing an abundance of variety, only cost £13 each. The mains aren’t necessarily the cheapest (ranging in price from £26 to £32 for meat and fish options), but the pichounettes won me over hands down. Wow! Price range: £39 – £55 for three courses from the a la carte menu. 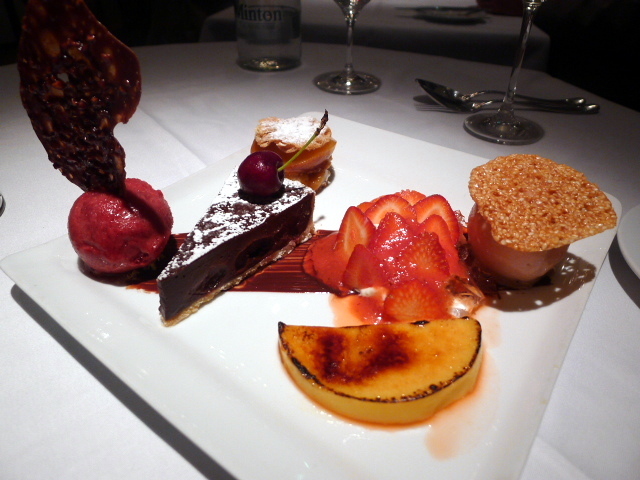 Or a starter pichounettes platter and a dessert pichounettes platter to share, plus a main each (which is what we had) will work out at £33 – £45 a head. Excludes drinks and service. Fabulous photos. Great text. I feel as if I dined with you! The Hungry One can rarely be kept from a dessert platter. Thank you for the heads up! thanks for the lovely compliment. I really appreciate it.